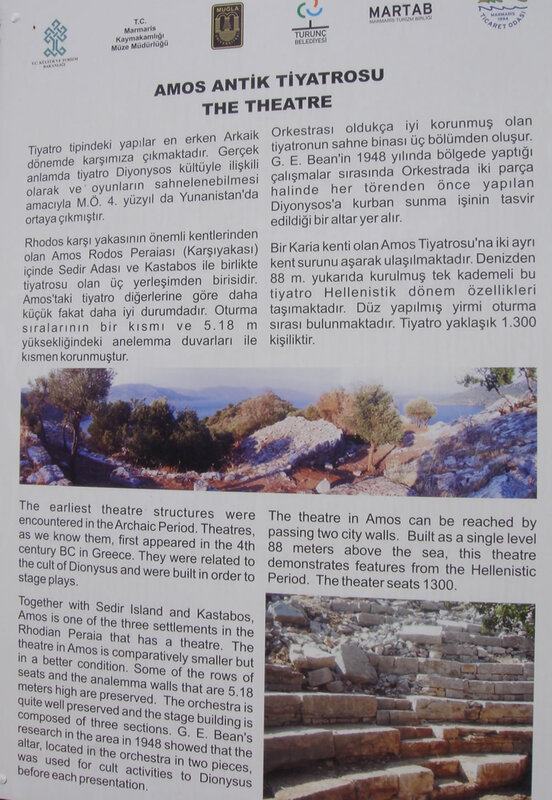 An easy walk on paved roads all the way to the ruins of the ancient city of Amos. The ruins, thought to date back to around 200 B.C., are in surprisingly good condition, and are a must see for anyone visiting the area. The walk takes about an hour (just over 4km) in each direction, although you should allow longer on a really hot day. To visit the ruins you must leave the road for a short distance but the path is in good condition and there are wooden steps to aid the climb to the ruins themselves. 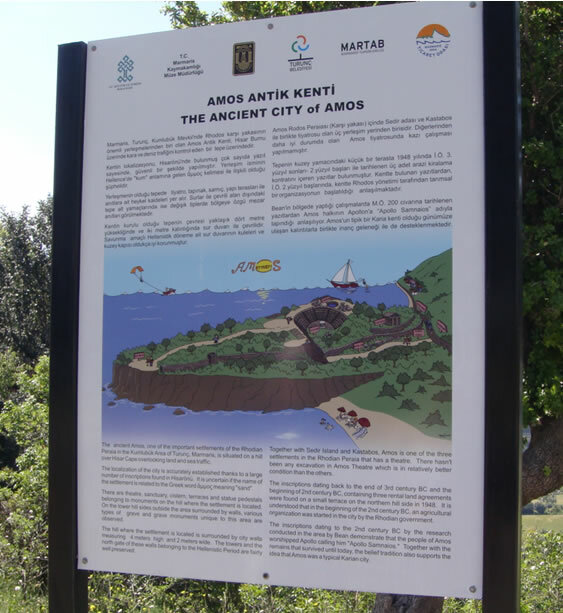 Alternatively you can take a rest and enjoy the views before embarking on the return to Turunç.Amos dates to the Hellenistic era and now consists of an amphitheatre on the side of the hill, a temple and statue pedestals. Surrounded by ramparts dating back to the same time, this amphitheater is in good condition, including its seating area, side walls and stage with three chambers. Excavations in 1948 by Professor George Evards Bean revealed four inscriptions, which mentioned three rental contracts, thought to date from around 300 to 200 B.C. 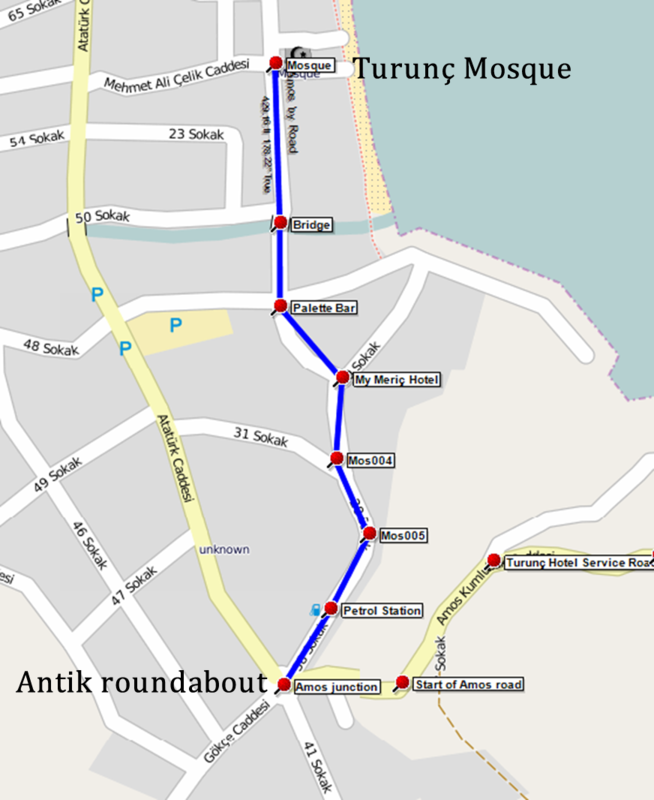 Turn left at the Antik roundabout, following the sign to Amos. The road climbs steadily until you reach a fork in the road where you keep right (the left fork is a service road for the large Turunç Hotel). 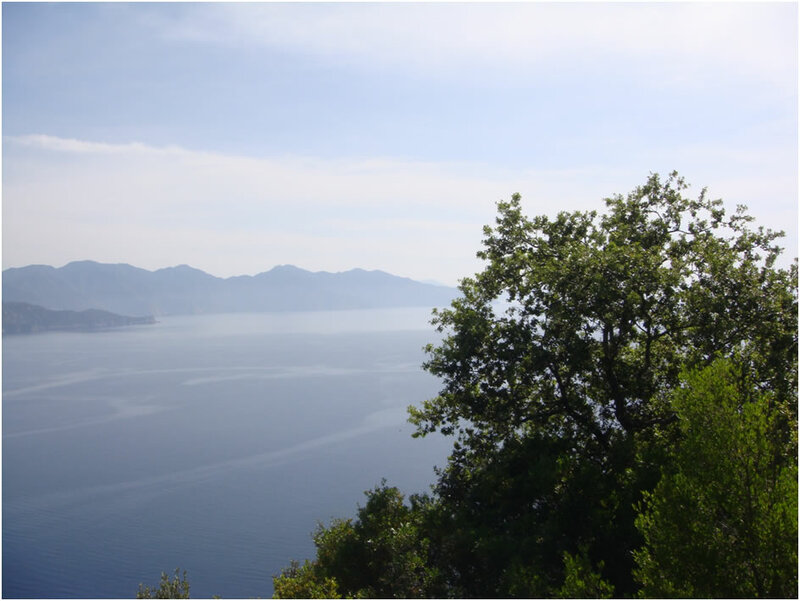 Continue on the road, skirting the Turunç Hotel on your left, continuing to climb until the road bends to the right and an amazing view across the Mediterranean opens in front of you. From View Point 1 continue on the road and after about 300m you will pass the Turunç Sewerage Works set down towards the sea on your left - you probably won't want to linger here on a hot day! Continuing on the road for another 600m and on your right hand side you will pass the end of the mountain path from Turunç. This offers even more spectacular views from higher up the mountain and is a wonderful mountain walk, but quite rough in places and more demanding than the road. 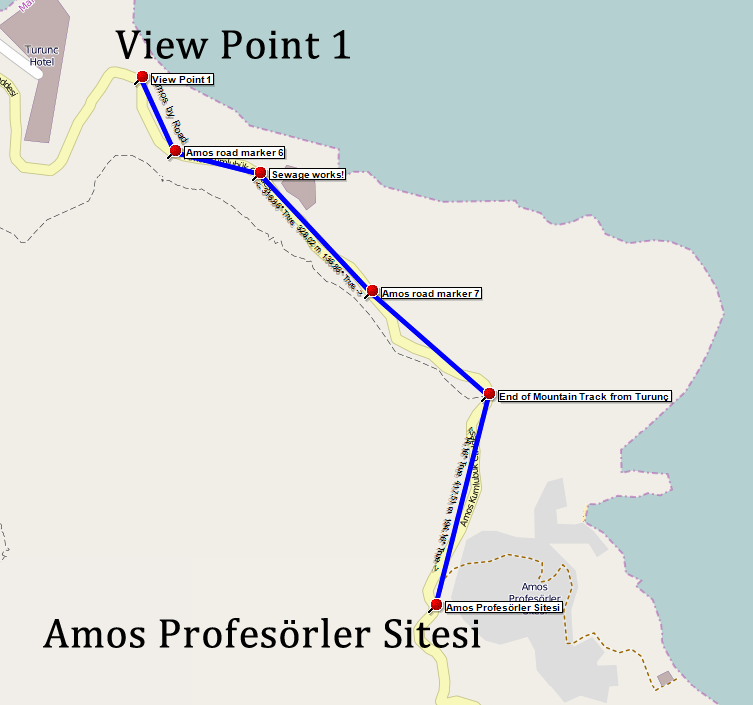 A further 200m or so and, on a bend you the road you will find the entrance to the Amos Profesörler Sitesi. Here you will find the famous Amos White Houses, at the top end of the site, and Amos Red Houses lower down. 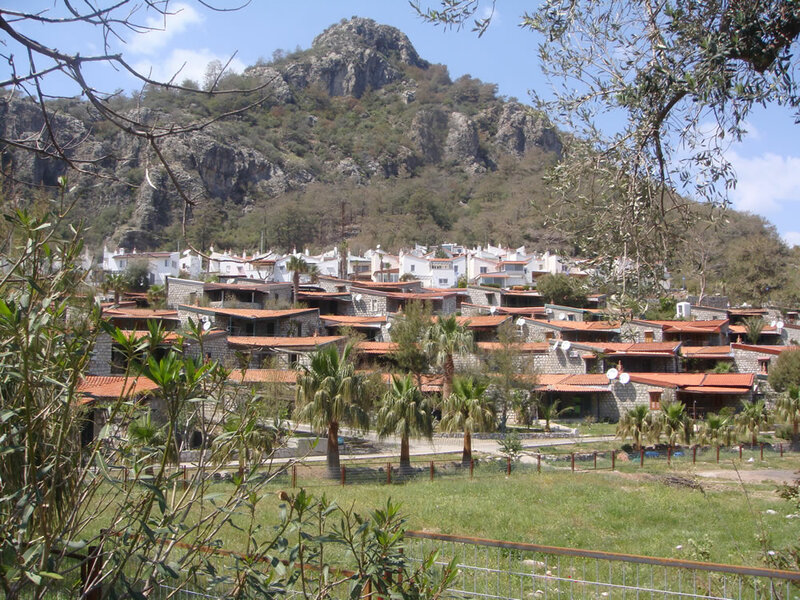 Formerly holiday homes from staff from Marmarar and Anadolu universities, they are now largely privately owned. 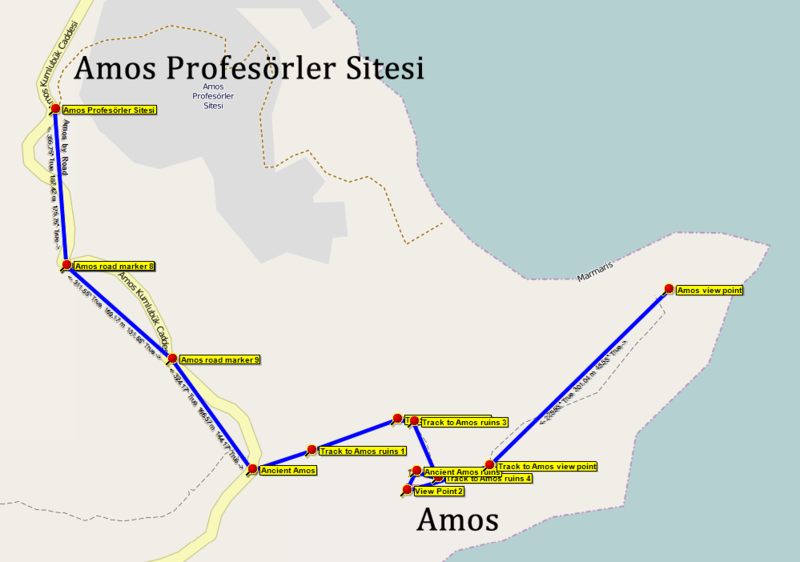 The road continues for around 500m until you reach the ancient city of Amos. There is plenty of interesting scenery, flora and fauna to keep your interest as you approach this fascinating historical site. There is a clear sign showning the entrance to the site. At this point the track leaves the road for the first, and only, time on the walk. The track is clearly marked and recently refurbished with new signs and wooden step on the steeper parts. The ancient ruins are quite unique and well worth the effort. 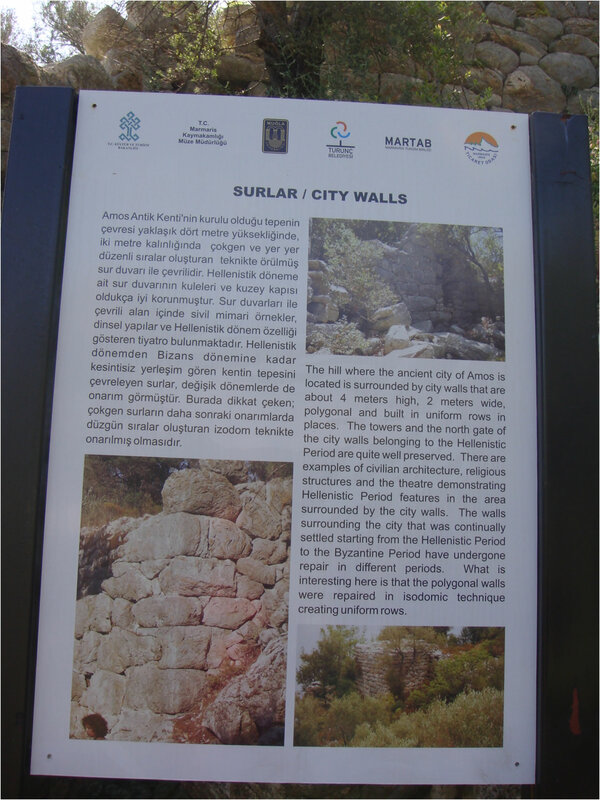 It is about 220m to the summit - look out for the remnants of the City Walls on the way up. 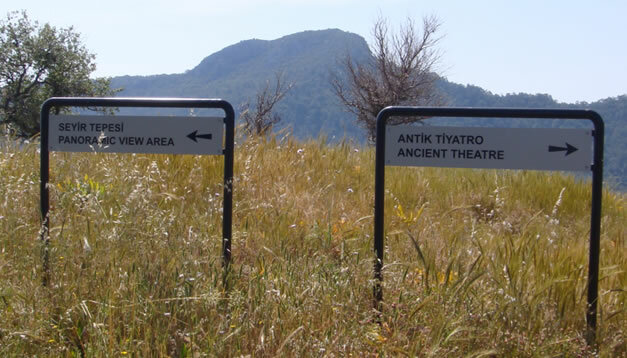 At the summit you can turn right to visit the Theatre or left to go to the 'panoramic view area' A visit to the Ancient Theatre is essential. The whole site has never been excavated and you can sit in the theatre and view the stage while soaking in the atmosphere; this is a completely unspoiled site. 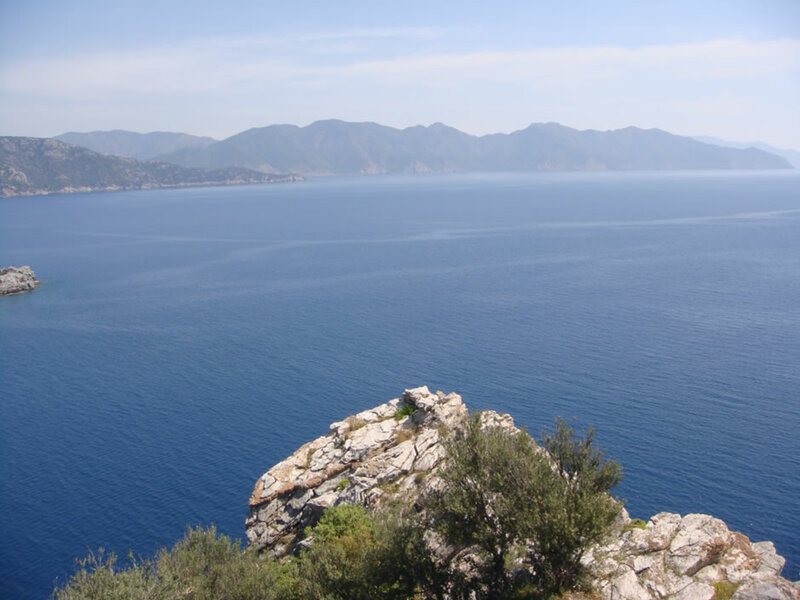 From the Theatre walk a few meters to View Point 2 and you can enjoy spectacular views over Kumlubükü Bay. 400m from View Point 2 you will find the spectacular Amos view point. This has stunning views over the Amos Profesörler Sitesi to your left, the Mediterranean straight ahead, and Kumlubükü Bay to your right. Watch out for the variety of insect and plant life on your way. 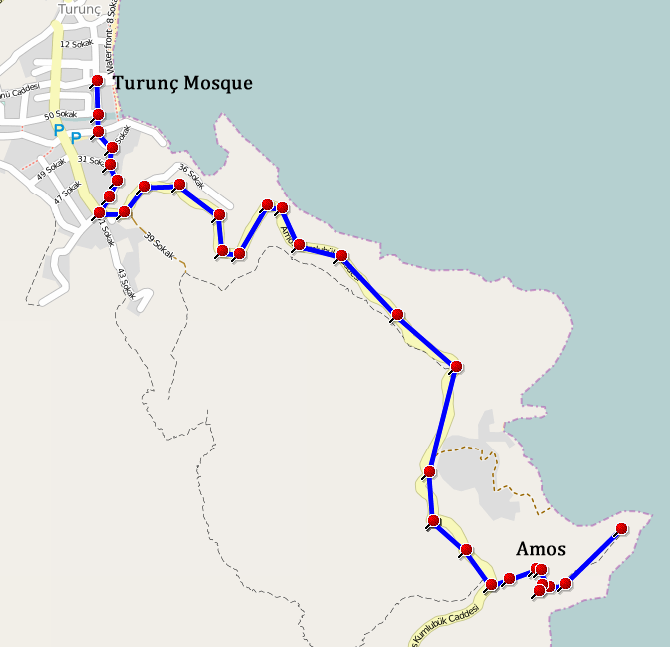 The return to Turunç retraces the outgoing route.